Opening the Ozarks: first families in southwest Missouri, 1835-1839, by Marsha Hoffman Rising is a genealogical tour de force – each of the first 1000 settlers in southwest Missouri seen through a careful examination of their primary sources, especially land and court records. Their families are explained and reconstructed through censuses and wills. Their origins traced, where possible, to the states and counties whence they came. Those of us with ancestors covered in these four volumes owe a great debt to the author. We can start to repay it by learning how to do genealogy according to the standards that make it reliable. In addition, we can review the entries most pertinent to ourselves, and offer corrections and additional information where necessary. In my case, it was a surprise to read that my 3rd-great-grandparents, S. M. and Mary (Goodin) Gilmore, “had no issue.” I suspect the sentence was misplaced, and might have been intended for a sibling. There is a web site with corrections to Opening the Ozarks that is readily findable, but it looks like there’s a lot of work still to do. This is why publishing a vast set of genealogical proofs in four print volumes, in the 21st century, should be called into question. In a work this vast, and no matter how carefully prepared and edited, there are bound to be a considerable number of errors and gaps. And one suspects that the editorial process needed to catch most of the errors would have set publication back two decades. A web site of errata is helpful, but also not ideal, even if most libraries have wifi, and assuming you find the web site while using Opening the Ozarks. There is a digital image edition of Opening the Ozarks, but its use is limited to those users in certain libraries (LDS Family History Centers, for example). A wiki edition would permit expansion of the scope of the work to include families who didn’t own property, or who were themselves enslaved as property under the law. This would also give due recognition to the sociological aspect of the work that guided its inception. A wiki edition of the entire text, even if editable only by the American Genealogical Society, could provide a solution. It would also allow for the work to be continued, with just as much care, into the next 1000 settlers and beyond. This work already deals with a large number of the persons listed in the 1876 Atlas of Greene County, a work that is begging to move from merely being digitized, to being made into a digital resource (linking from each parcel on the maps to the equivalent 1870 census pages, for example). We are supposed to be 5th or 6th cousins. 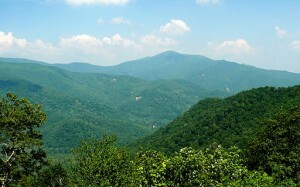 Some of our ancestors lived in the same area of far western North Carolina at the right time. Back then, the entire western tip of the state around Asheville was a single, large county by the name of Buncombe County. But despite our having well-documented family trees, the common ancestors will not show themselves, and the actual connection pointed to by the genetic data can’t be established. I have to guess this is a common story for everyone who is attempting to add DNA to the genealogical toolbox. In this case, « we » are three people, previously unknown to each other. As usual for me with 23andMe, this match appears to be related to the frontier zone where my maternal grandmother’s ancestors mixed, met and married before the move to Missouri that created her own family community. I suppose more data from more participants, especially from cousins like the Justices who remained in the Asheville area, would help us figure out who swapped DNA with whom. The search for this connection did turn up an interesting bit of trivia, though. Elvis Presley’s ancestors lived there in Buncombe County, too. We have just found out a bit more about our place in the U2 haplotype, and in the FTDNA community. Thanks to information kindly supplied by the FTDNA Haplotype U2 Project coordinator, the picture has become more clear since the time we had the full mitochondrial sequencing (FMS) done. My mom’s mtDNA puts her in a subclade that is rather rare. Among the known samples, it has not acquired any mutations for 7500 years, making it difficult to place geographically. Two other known samples are related to Britain and Ireland, and the long presence of U2 and U2e in prehistoric Europe is well known. In 5500 BC or therabouts, the farming practices of the Neolithic were finally moving beyond Greece. Hunter-gatherers still occupied the majority of the continent. Life expectancy among the Neolithic farmers was 20-25 years of age, and 50% of children didn’t make it to 15. Even so, one imagines that the farmers thought themselves better off than the ones who didn’t farm. The question that remains to be answered is how many of the Neolithic people were incomers, as opposed to how many were adopting the new culture. One zooarchaeologist, Nerissa Russell, has conjectured that the use of cattle as bride-wealth may have eased the spread of the Neolithic farming economy as it moved through an already-inhabited Europe. This is one way that pre-Neolithic genetic lineages may have survived the immigrants. Until there is a lot more mtDNA evidence, it will be difficult to determine how clade U2e came to be in Europe. Most of U2 is actually found in South Asia. But this haplotype is so ancient that there would have been plenty of time for U2e women to move slowly west, arriving well before the European Neolithic. Or perhaps they moved just far enough west to move into Europe along with the Neolithic pioneers. From the other direction, from the present, it’s pretty certain my mom’s foremothers lived either in the British Isles or western Europe (probably the Rhineland) in the centuries before emigrating to North America. In terms of genealogy, this hinges on the origin of a woman whose married name was Esther North. In colonial Virginia’s Shenandoah Valley, settlers from Germany mixed with English and Scotch-Irish settlers, so Esther’s origins could go either way. Her daughter married the son of an immigrant from Switzerland, and their daughter married the son of immigrants from Westphalia. We are really lucky in that these families have been very well documented by very hard-working genealogists. There will come a point when the historical record just won’t be there for my line of foremothers, and that provides a big motivation for participating in mtDNA analysis. Right now I’m hoping that genetic testing will get really trendy so that enough data will become available to fill in the gaps, not just in prehistory, but in the historical times where ordinary farming folk aren’t documented. It is to be hoped that no one is ordering these kits without already having given that some thought. At 48, free of major scary diseases, and with none on either side of my family, I’m pretty confident I can handle what surprises may be left. Those who know my tendency to hypochondria and anxiety would probably prefer I stuck to the ancestry side of this information. But the thought of contributing data to scientific research is too tempting. I’ve been reading the research produced in archaeology with human and animal DNA studies for some time now, and it’s an exciting field. Of the negative consequences, insurance companies using this information against me in some way is my biggest concern – but again, given the fine state of health of me and my nearest relatives, it’s just a concern, not a worry. On the other hand, this next foray into DNA analysis may not turn out to be that much of an adventure after all. It’s been a couple years since my mom’s mtDNA was analyzed. At that time, Family Tree DNA was the option I picked, and it was a Mother’s Day present. With genealogical records tending to favor male ancestry, I really thought we should have some insight about deep maternal ancestry. As expected, it was European (but there was always a slight chance of origins on two other continents, since my maternal grandmother’s ancestors were colonists and frontier people in North America from 1622 on). And it was really European. According to that test, my mom’s maternal ancestry reaches back to a now-rare haplotype that is associated with the earliest paleolithic inhabitants of Europe. And a lot of other places as well, like South Asia. 55,000 years is a long time! Also as I’d hoped, there were indications of correlation with some Gaelic surnames, but as with all DNA analysis, it’s hard to know what these things really mean in a concrete, significant, historical way. We also get email every time a “match” turns up, but so far this has not led to any stunning genealogical revelations. A match is a possibly very distant cousin, whose relationship to my mom probably predates the relevant historical records. It’s hard to find time to add yet another bunch of action items to my already neglected inbox (it’s a system I call Thinking About Getting Things Done). One of my goals for this little break from professional life in between semesters is to catch up with several family history projects. 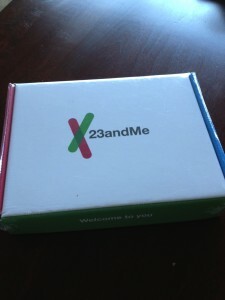 Exploring the Family Tree DNA “matches” is one, and 23andMe will be another. Then there’s the old-fashioned hard work of paper trail genealogy that needs to get brought up to date as well.